Enjoy a deeper, healthier night’s sleep with the Reflection 8” Mattress. This mattress features a plant-based memory foam topper that cushions your body in weightless comfort, and relieves muscle tension so you can sleep soundly and undisturbed. A plant-based foam core provides cushioning support across the mattress. The NaturaWool lining wicks away moisture for temperature controlled sleep, reducing tossing and turning. This mattress is covered in an organic cotton blend for a fresh, breathable sleep surface. Foundation not included. 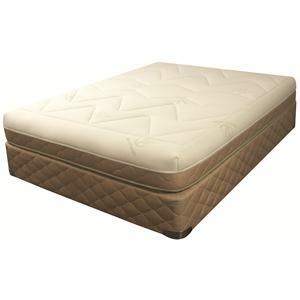 The NaturaPedic Reflection 8" King Memory Foam Mattress by Natura World is available in the area from BigFurnitureWebsite.